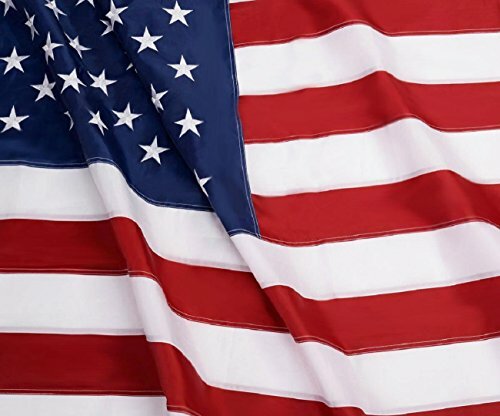 USA Nylon Flags by Embroidered Stars and Sewn Stripes Premium Quality Material This Heavy Duty American Flag Is Made of Durable Nylon Material to Help Withstand the Windy Outdoor Environments. Don't Buy A Paper Thin Polyester Flag That Will Be Tore Off Within A Week! You will fully appreciate the workmanship and quality of this flag. Embroidered Stars and Sewn Stripes When your US Flag arrives at your home or business, you will immediately see the amazing workmanship. Beautifully Built with Embroidered Bright White Stars and Sewn Stripes! It Is Time to Show Your American Pride in the Right Way! Heavy Duty This Flag has 4 Rows of Lock Stitching on the Flying End and Two Strong Brass Grommets on the Heading to Imporve Durability. It Is Guaranteed to Fly At Least One Year! Embroidered Stars and Sewn Stripes - Amazing Craftsmanship, Beautifully Built with Embroidered Bright White Stars and Sewn Stripes! It Is Time to Show Your American Pride in the Right Way! If you have any questions about this product by DANF FLAG, contact us by completing and submitting the form below. If you are looking for a specif part number, please include it with your message.